Hey, guys - and if I haven't said it yet, thanks so much for all your great suggestions for grammar posts. Let's blow the dust off these kitties and get back to work! My lovely assistant Willow will now help me select a letter from the mailbag. ...on second thought, let's pull one from the blog comments. "I don't really know the name for this, but proper subject/object usage of a pronoun at the end of a sentence. 'Erika is more tired than [him/he].'" Can you see where the words were omitted? 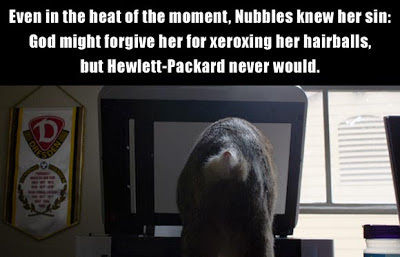 God might forgive her for xeroxing her hairballs, but Hewlett-Packard never would forgive her for xeroxing her hairballs. That would be redundant and boring and ruinously unfunny, of course, which is why we used ellipsis to shorten it in the first place. 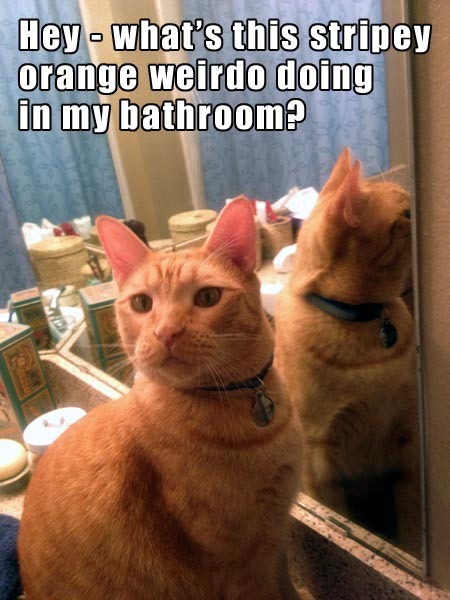 And we do this ALL THE TIME. Will you do the honors, or shall I (do the honors)? If she's having a beer, I'll take one (beer) too. So let's go back to Matt's sentence. If, as Matt did in his original comment, we get rid of the ellipsis and write out all the words, it's much clearer: Erika is more tired than [him/he] is. "Well," you may say, "'Erika is more tired than he is' makes perfect sense, but if I want to keep it short and sweet, 'Erika is more tired than he' sounds kinda strange." Destroy him, human. He respects you even less than me. 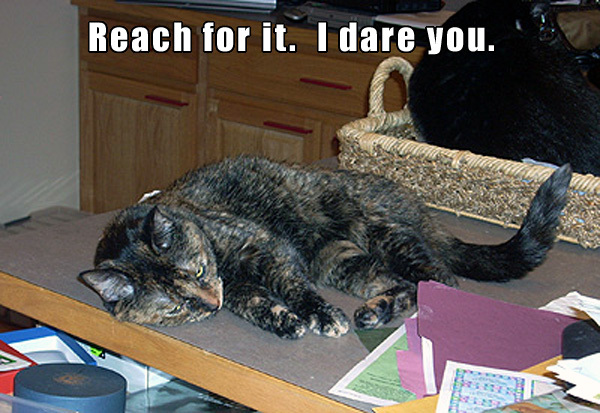 Destroy him, human. He respects you even less than I. He respects you even less than (he respects) me. He respects you even less than I (respect you). The meaning of the sentence changes based on the pronoun he uses! "Well," you may say, "I can see the difference when we write it out, but I wouldn't have picked up on the difference if I were just reading normally, and I don't think many other people would either." This is very true, hypothetical reader. Normally, most of us would assume that sentence #1 was what was meant, regardless of whether it used "I" or "me". If we wanted to communicate sentence #2, we'd say, "He respects you even less than I do" to remove any ambiguity. So, cards on the table: here are three useful things to know about this whole ending-a-comparison-with-a-pronoun thing. 2. With that said, if you are dressing your writing up in its Sunday best, you should probably do as we've done here: use the ellipsis test to choose the pronoun that would still be correct if you added back the words you skipped over. This is the safest and surest way to prevent knuckle-rapping from the five-pinkie people in your life. Because as we've said before, there's really no such thing as "correct" and "incorrect" grammar. There's only the kind that gets you your desired result, and the kind that doesn't. So here on the Fourth of July, let me encourage you to say Happy Birthday to America by celebrating one of our most famed pastimes: speaking whatever the hell way we feel like and damn the torpedoes! 1. Willow, courtesy of the one and only Frank the Magnificent! Questions? Kitties? Send them in! Great post. I'm gonna have to bookmark this in case I need to reference it later. Great post as usual! Part of me believe I recall this topic from the A to Z, but it may have been something similar. I know it's still a tricky subject for me. Thankfully the grammatical version is almost naturally attributed to speech/written word. I honestly never paid attention that I was omitting words. While I hope I got the gist (possibly twice over), I have to say what blew my mind was "cut-and-dried" as I always thought it was "cut-and-dry" lol Odd I know, but I was like "Whaaaa?!" So much so I had to Google it and it seems both version are interchangeable? I think is what I gathered from the research. I'll have to check out Matt's blog and possibly M.E. Kinkade's. As long as they are patient! I have to venture back to Patricia's as I've neglected it way too long :-( She may have already forgotten who I was. I'm so freakin' slow! aMEN, buddy. I'm so sorry to have left you hanging for so long! I wish blogging could be my job, but I can't imagine why anyone would hire me when I've basically demonstrated Homer-Simpson-esque levels of indolence and ineptitude. Ah, well - WE know we're cool! And however slow you are, I am right there with you, buddy!